I am hoping that Fancy can come home tomorrow! She has been entered in three MI shows where there is a major every day. Guess what Fancy needs to complete her Championship? Yup, just one major would do it. She just has to win one day out of three…..I haven’t heard how the weekend has gone so far, so I am on pins and needles to find out! I still know of a boy puppy….VERY intelligent and easy to train! What a sweet lover! Seriously, I showed him how to go up and down the stairs just ONE time and he’s been trouping up and down them most happily ever since. If you have ever worked with a puppy on stairs, you know how special this is! Much more typical gleam of mischief in the eye! Deceptively well mannered for this photo! Mount camera on tripod and focus.Find puppy and take dirty sock from mouth. Put cat outside and dab peroxide on your puppy’s scratched nose. Sit back in chair with lemonade (preferably spiked) and resolve to teach puppy “SIT” and “STAY” the first thing in the morning. Zip Zilch nada zero….that is the number of puppies we will be seeing this summer. I am so bummed out. There was actually did a little scratching in the whelping box as though she were nesting but I have to say it–all false pregnancy. I’m making it official now and will work up what our winter puppies might be for those who are willing to wait. Refunds all around for those who would like one. You can contact me or allow me to contact every person with a reservation over this upcoming weekend to ask your preference. I am so bummed out after being psyched up for puppies and I am sure that you all are too! Biology….what can I say? AKC and Me: We could use some help! Here’s a link to a worthy petition at the AKC. I signed, would you? Responsible breeders pay careful attention to health, breed standards, and temperament when breeding their dogs, they socialize their puppies and give them lots of fun stimulation, and have national reputations as producers of top-quality puppies. Because of this, they often ship puppies across the country to new owners who have bought their dogs specifically because they want a puppy from this particular breeder. They want a dog that is guaranteed to be healthy, from genetically sound parents, and with a proper puppy upbringing. 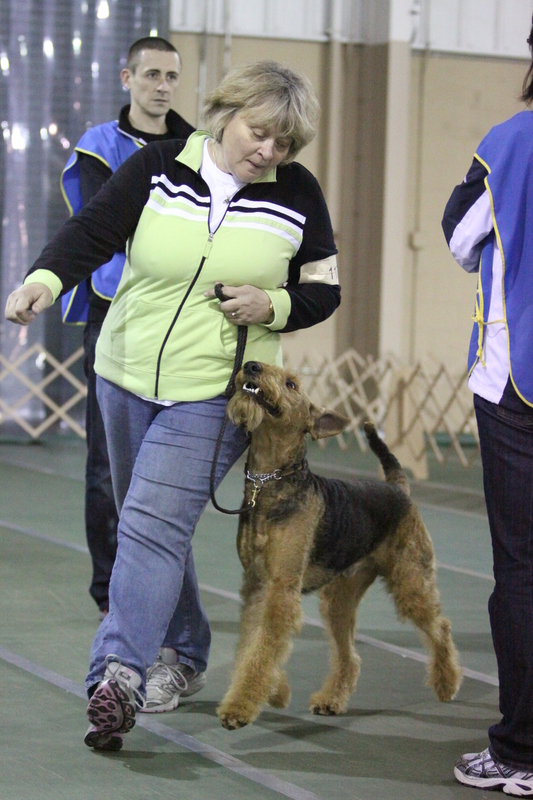 These are often people who want to compete in the show ring, in obedience, rally, and agility, or who want a dog to train in search and rescue or hunting. They also want a good pet who can live with them, other people and other dogs and be a great companion. Under the USDA proposed regulations, these responsible breeders would no longer be able to provide dogs to anyone who can’t personally show up to pick up the dog. The breeder’s reputation will no longer be enough to allow them to ship dogs to new owners. Please help the AKC convince the USDA that these regulations are not needed and create an undue hardship for these excellent breeders. These folks are NOT puppy mills and don’t deserve to be treated as such. Our expectant mom is CH Seneca Texas Sternchen, OFA Excellent. “Star” is a lively, busy, all-terrier girl blessed with wonderful shoulders and smooth “daisy-clipping” movement that you don’t see too often these days. What that means is that she is built to spend her energy efficiently and she has an abundant supply–so that means I’ve never seen her quit! This is a repeat breeding of a litter we had a year ago and we plan to feature several of the older siblings to the upcoming litter. 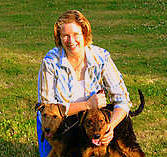 One comment I have to make: Linda Coates drove up 6 hours to aptitude test the first litter. ( Thank you, Linda!) Linda has over 30 years of training experience and, specifically, training experience with the past four generations in the pedigree. When we saw the responses of that first litter—well, I’ve been PAT evaluating puppies for 9 generations and I saw amazing bold reactions that I had NEVER seen before. What’s an example? Well, three of the aptitude evaluations are to check the puppies’ reactions to unusual environmental stimulus–startle reactions of SIGHT, shyness to NOISE, and CHASE instinct. For NOISE, we loudly bang a metal pan. It’s a harsh, startling noise. Puppies are tested individually in a place new to them, by a person they do not know. 3. the boldest, most stable puppies will look in the direction of the noise and then approach the pan to check it out. 4. RUN toward the pan and the tester while the pan is STILL BEING BANGED. They couldn’t wait to see what all the noise and excitement was about and had NO observable startle/recovery period. What does it mean? Well, we will be following the current progress of some of the puppies as we wait for the puppies in June. 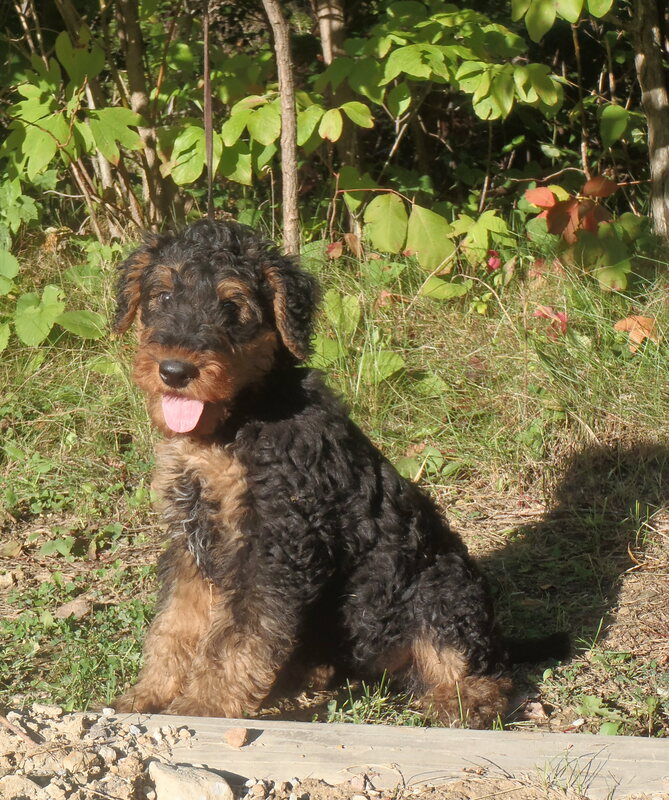 Announcing…..Expected Puppies’ Arrival Date–June 25! Puppies are due June 25, 2012 from our best conformation/performance parents! The sire is Seneca Whodunit’s Case Closed CD, TD, OFA Good. “Slammer” as known by his friends, is descended from a long line of very impressive over-achievers on both sides of his pedigree. He is currently focused (very intently!) on his tracking, aiming at his Variable Surface Tracking Title after earning his TD at 9 months old. 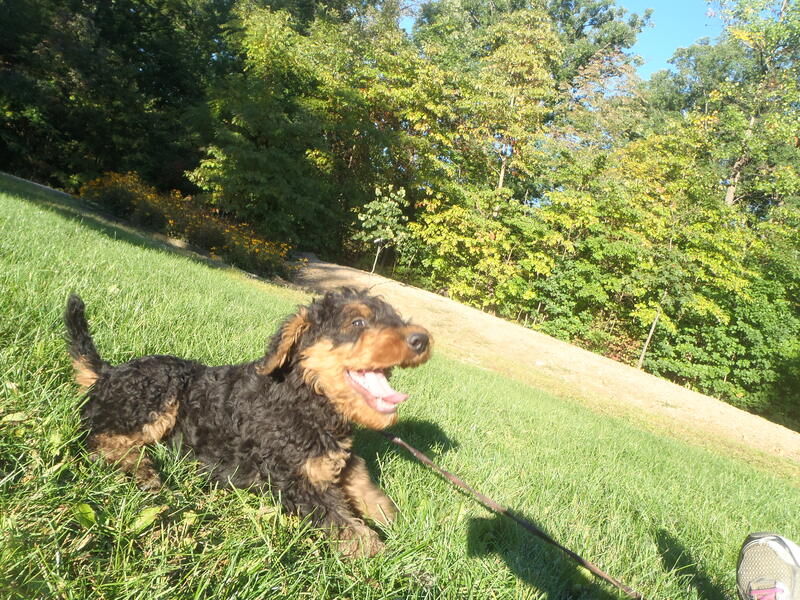 Slammer is also active in Open obedience training for his CDX and is thinking about when he can ever find time to finish his conformation championship….He was born June, 2009. U-CDX CH Whodunit’s Murder Mystery UDX, NA “Butler” flies over the bar in Utility. 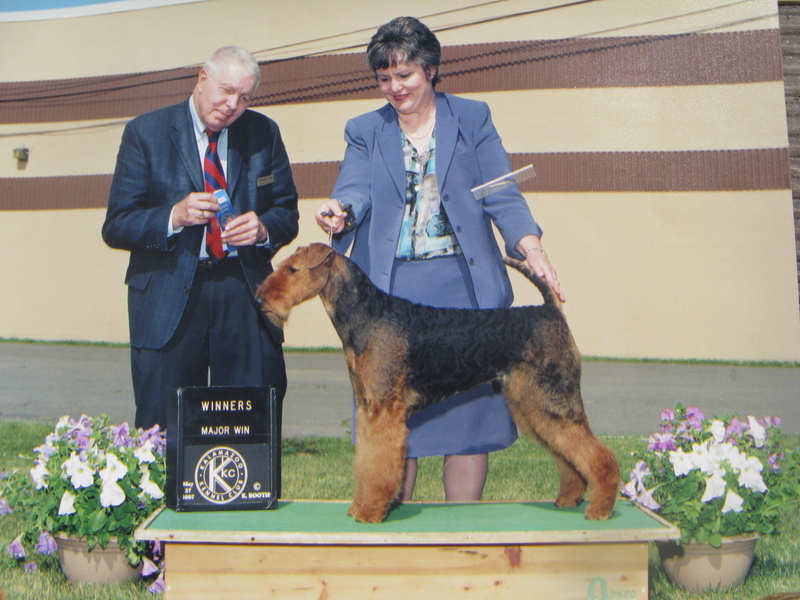 The expected puppies’ paternal grandsire: U-CDX CH Whodunit’s Murder Mystery UDX, NA, #1 US Obedience Airedale 4 years and was the first Champion to earn a UDX and first Airedale to go High Combined at the Natl Specialty. He is the sire of multi-titled tracking, agility, obedience, and conformation dogs. “Butler,” lived a wonderful life to the age of 15! 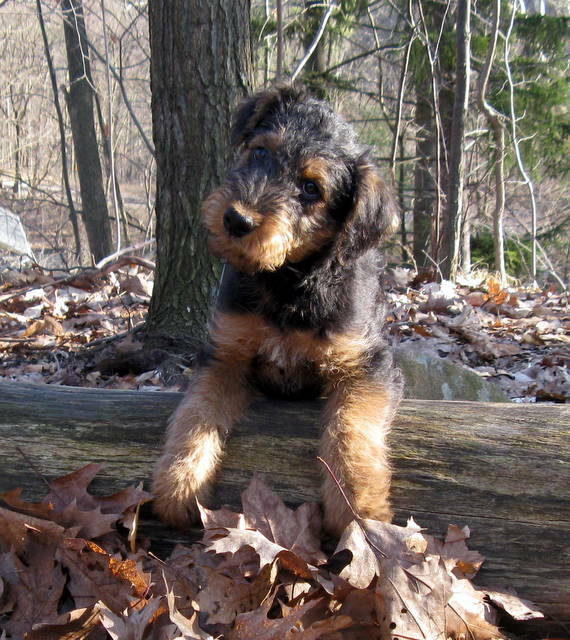 Littermate brother to: Cyclone’s True Friend UD, TDX and U-UD Whodunit’s Charlie Chan UD, #1 US Obedience Airedale two years and #1 Canadian Obedience Airedale 1998. Everything on this page is about the “daddy.” Coming next: a profile of the expectant mother…..